The world of Panopolis is a place where superheroes and supervillains reign, but it’s clear that shadowy GenCorp is the power behind their thrones. The heroes in particular are controlled by their handlers—they feed them, house them, pay them, control their sponsorships and generally run a company store to keep them beholden. I honestly can’t think of anything better than superhero romance. If you ship Captain America and Bruce Banner, Where There’s A Will by Cari Z. is the book for you. The third in the Panopolis series, it does rely a bit on the events of the first two books, Where There’s Smoke and Where There’s Fire. If you really only want to read this one I think everything is explained sufficiently that you won’t be lost, but they are all great and you should definitely not skip any. Superhero Freight Train’s given name is Craig Haney, not that anyone ever calls him that. He had been a police officer prior to being doused in the chemicals that gave him a personal force field. He’s a got a Captain America-like belief in the system when we meet him in an earlier book, but the events of Where There’s Fire have shaken his faith a bit. It turns out that GenCorp has been keeping vital information from him, which spurs him to cooperate with a couple of villains as they seek out the truth of his situation. Ari Mansourian has just been hired by GenCorp to take over their Research & Development department. He is particularly fascinated by Freight Train’s force field, which brings them into each other’s orbit. Not that Freight Train minds. He finds Ari incredibly attractive. It doesn’t hurt that the doctor seems to really see him in a way that no one else has in the seven years since he got his powers. Right away Ari understands the desolation behind his strong man persona. The most powerful thing about the relationship is the assuaging of the loneliness and longing Craig experiences. It turns out that being a superhero, particularly one whose power is uniquely alienating, isn’t all it’s cracked up to be. Throw in a judgmental relative, a lovey dovey supervillain couple and a handler who just doesn’t listen and it’s impossible not to feel sorry for poor Craig, making the connection between him and Ari all the more poignant. In the vein of Logan Cale from Dark Angel or Mr. Universe from Firefly, a character calling themselves SuperTruther frames the story with skeptical revelations about many aspects of life in Panopolis. He provides an almost allegorical critique of the dangers of corporatist government; the overarching social messages of the series are anything but subtle. That said, it lends depth to the series beyond the romances. The mystery of SuperTruther’s identity is equally intriguing and frustrating with just tiny hints dropped in Where There’s A Will. I sincerely hope the series continues as it’s torturous to leave us in the dark. Panopolis is the best series I’ve read in a while. The moral ambiguity, the SuperTruther mystery, the sweetness of the romances and large cast of fascinating characters make for a vibrant setting and I intend to pester Cari daily to keep writing them. They’re that good. 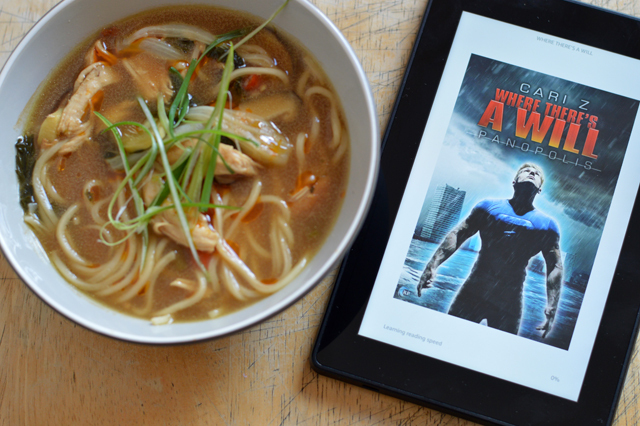 This soup is relevant to the book, I swear. I just can’t explain how without seriously ruining nearly every surprise it holds. And there are several. Ah well. Suffice it to say that there is a spicy chicken soup delivered to Craig’s apartment at various points. It’s important to the over-arching plot and it’s important to the romance. It’s also really, really spicy. If you can’t find the quick-cooking Chinese egg noodles I recommend in the instructions (you’ll need an international grocery store probably), you could use just about any noodles, from ramen to spaghetti. It won’t be quite the same and the noodles would need to cook a bit longer in the case of the spaghetti, but the rest of the ingredients won’t be harmed by an additional few minutes boiling time. So feel free to make substitutions. 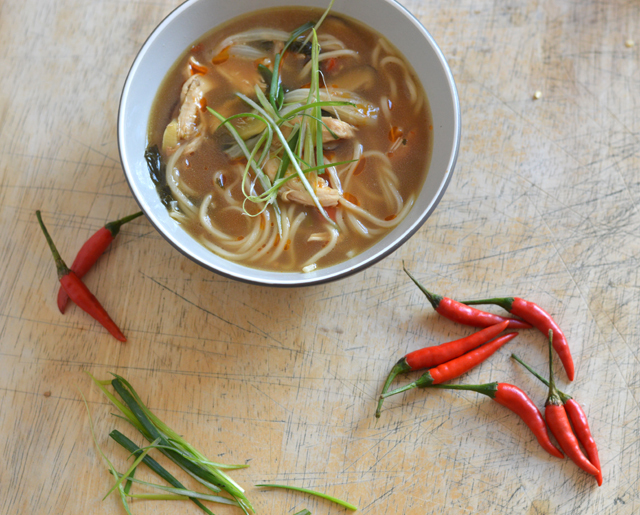 I’ve deliberately provided instructions to make this Chinese take-out style chicken soup almost too spicy. If you’re not of the spicy persuasion, you can leave out the chilis and chili oil entirely. With the ginger, garlic and green onions, it will still be plenty flavorful. However, if you do occasionally enjoy burning the hell out of your sinuses, making your eyes water and your nose run, you should find it satisfying as written: with chilis, seeds and chili oil to top it all off. Especially if you’ve got a cold to chase off. Not that Freight Train gets colds. 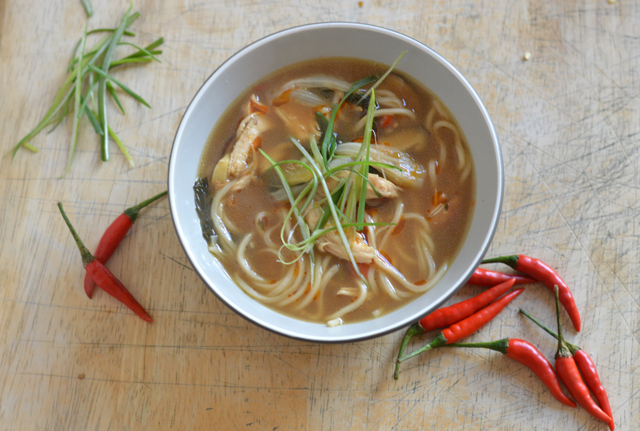 A spicy chicken soup, Chinese take out style. Heat sesame oil and vegetable oil in a large pot over medium-high heat. Add chicken, skin-side down and cook until browned, about 4 minutes each side. Remove to a plate and pour off all but 1 tablespoon oil. Add ginger, garlic and chilis and cook for 30 seconds. Deglaze the pan with the rice wine and return chicken to the pot. Add the green onions, mushrooms, soy sauce, stock and water. Bring to a boil, then the heat to low and allow to simmer for 30 minutes until the chicken is done. 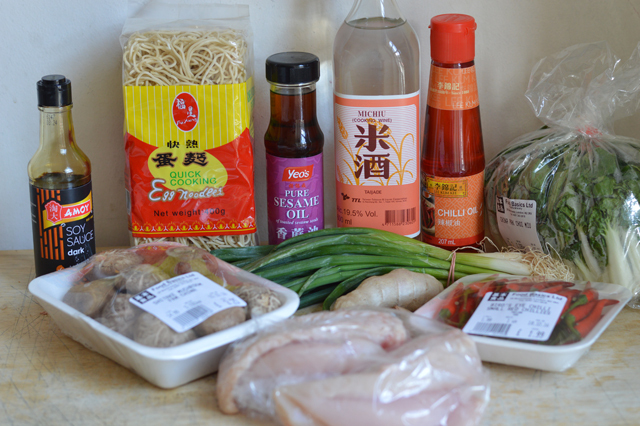 Remove the chicken, return the broth to a boil and add the noodles and bok choy. Boil for 3-5 minutes or follow package directions. While the noodles cook, remove and discard the chicken skin and shred the chicken with two forks. 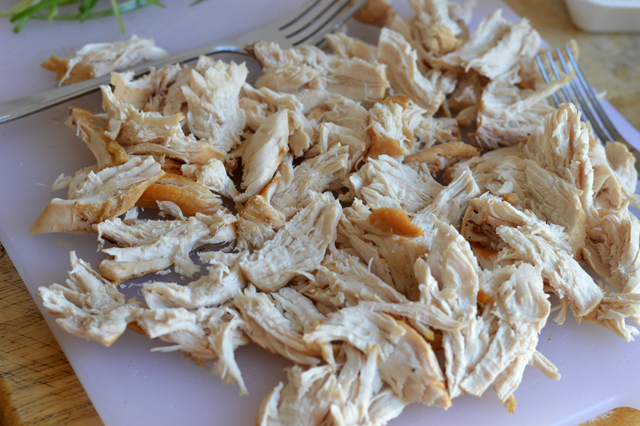 Return the shredded chicken to pot. Serve with sliced green onions and a drizzle of chili oil, if desired. *Remove the pepper seeds and ribs for a slightly less spicy soup. I received a complimentary copy of Where There’s A Will from the publisher for review purposes. So glad to see your posts again! I missed Cooking Up Romance over the last few months. Thanks! Cooking in London has been wonderful, but I’m afraid translating back and forth between Celcius and Fahrenheit will introduce errors. Plus all the packages are weird sizes, making quantities challenging. I haven’t wanted to publish recipes full of mistakes! This one was simple enough though.